BAGHDAD, Iraq (CNN) -- A man with ties to a radical Shiite cleric is in U.S. custody in connection with an attack that killed five American soldiers in Karbala in January, U.S. officials said. "Over the past several days, coalition forces in Basra and Hilla captured Qais Khazali, his brother Laith Khazali and several other members of the Khazali network," the U.S. military said in a statement Thursday. The military said the network is "directly connected" to the killings in Karbala, a Shiite city south of Baghdad. Qais Khazali was known as a spokesman for Shiite cleric Muqtada al-Sadr's political movement in 2004 in Baghdad's Sadr City, but it is not clear whether he is still involved with al-Sadr's movement. Al-Sadr's Mehdi Army, a Shiite militia, is suspected of heavy involvement in Iraq's sectarian violence. Two Mehdi Army commanders told The Associated Press that Khazali had split with al-Sadr and leads 3,000 fighters of his own with financing from Iran. Khazali has not been seen in public since late 2004, the AP reported. U.S. officials have been tight-lipped about the arrests. The military has not disclosed evidence linking the Khazali network to the Karbala attack, but one official called it "significant." A source close to the al-Sadr movement said the arrests occurred Wednesday. A U.S. official said the Khazali brothers were suspected of being part of a network using weapons known as explosively formed projectiles or penetrators. Bush administration officials have alleged that the Iranian Revolutionary Guard's Quds Force have provided these munitions to Shiite groups in Iraq. In the January 20 attack, nine to 12 gunmen, wearing "American-looking uniforms" and carrying "U.S.-type weapons," passed easily through checkpoints in sport utility vehicles before opening fire on American soldiers inside a government compound in Karbala, according to the U.S. military. One U.S. soldier was killed and three others wounded in a hand-grenade blast. After the attack, the insurgents drove off with four U.S. soldiers, the military said. Iraqi police found abandoned vehicles and equipment near the Iraqi town of Al-Mahawil. Three soldiers were dead at the scene, and a fourth one died en route to a hospital. U.N. Secretary-General Ban Ki-moon got a taste Thursday of the violence in Iraq -- up close and personal. An explosion rattled Baghdad's Green Zone, rocking the room where Ban and Iraqi Prime Minister Nuri al-Maliki were holding a televised press conference. But it appeared to be just another day for the prime minister, who displayed his characteristic poker-faced demeanor. Al-Maliki's guards wanted to move him, but he indicated it wasn't necessary. The blast could be felt by reporters outside the briefing room as well. Mortar and rocket fire targeting the Green Zone is not particularly unusual, and it has occurred before during high-profile press conferences. Ban arrived Thursday morning in Baghdad on an unannounced visit. It marks his first trip to the war-torn country since taking office in January. U.S.-led coalition forces have arrested an al Qaeda in Iraq militant thought to be head of a car bomb network in Baghdad, the U.S. military said Thursday. The person is "believed to be the head of the Rusafa car bomb network, the Al Qaeda-Iraq organization responsible for some of the horrific bombings in eastern Baghdad in recent weeks," the military said. The militant was detained Wednesday in Baghdad, and three "key members of the network" were seized Thursday, the military said. Troops also found "a vehicle prepared as a car bomb and a cache of weapons and explosives." Also Thursday, a former Saddam Fedayeen leader "involved in setting up training camps in Syria for Iraqi and foreign fighters" was captured in the northern city of Mosul, the U.S. military said. The U.S. military has long been concerned about foreign fighters infiltrating Iraq from Syria. Members of al-Sadr's militia, the Mehdi Army, attacked the offices of rival parties Wednesday night in the southern Iraqi city of Basra, an official with the Basra provincial council said Thursday. Using small arms, Mehdi Army gunmen attacked the headquarters of the military wing of the Supreme Council for the Islamic Revolution in Iraq and the Fadhila party. Guards fired back at the attackers, but no casualties were reported, the official said. Al-Sadr's movement and the more established SCIRI have been rivals for political influence in Iraq's Shiite regions. The U.N. children's agency said an operation designed to supply clean water to Iraqis needs major financial replenishment. For four years, UNICEF has shipped tankers with clean water into deprived neighborhoods, primarily in Basra and Baghdad. The Baghdad operation -- which reached an average population of 70,000 every day -- stopped after running out of money on March 1. The Basra effort was halted two years ago because of lack of funds. "Iraq is still in an emergency situation, and many families simply have no alternative," UNICEF said in a statement Wednesday requesting more support. U.S. soldiers and Iraqi security forces began sweeps through two Baghdad neighborhoods Thursday, targeting al Qaeda and illegal militias, a U.S. military statement said. The operations began in the Ghazaliya and Ameriya neighborhoods, with about 1,100 U.S. soldiers working with 500 Iraqi soldiers and police. In separate operations northeast of Karma, coalition forces freed three hostages and detained 13 suspected terrorists, the military said. A civilian was killed and three others were injured Thursday in fighting between Iraqi soldiers and militants in the central Baghdad neighborhood of Fadhil, police said. A U.S. soldier and two Marines were killed Wednesday in combat in Iraq, the U.S. military said. With the deaths, 3,229 U.S. military personnel, including seven civilian contractors of the Defense Department, have died in the four-year-old Iraq war. CNN's Jennifer Deaton, Basim Mahdi, Jamie McIntyre and Mohammed Tawfeeq contributed to this report. 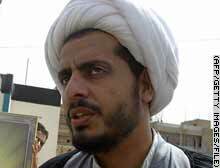 Qais Khazali, seen in a 2004 photo, has been a spokesman for radical Shiite cleric Muqtada al-Sadr in the past.